Nothing but the best crib sheet belongs in a baby crib. Period. Parents can often have the misconception that making their baby’s bed is the same as making their own, which is simply not true. Quilts, pillows, or top sheets have no place in a crib since they increase the risks of overheating and even suffocation. But this doesn’t mean you can’t make the crib look attractive and inviting with specialized crib sheets. They are safe, soft and available in a wide range of playful colors and delightful patterns. To help you choose the best crib sheet for your infant’s crib, we’ve put together this list of our favorites, as well as some tips for making the best crib sheet choice for your little one. 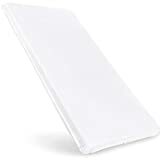 Babydoll Bedding Baby Doll Bassinet Mattress, 15" x 30"
Although there are plenty of contenders in the crib sheet market, there are only a couple leaders in their respective material category. We’ve listed the three companies and a couple of their most popular products to get your search for the perfect crib sheet started, seeing how picking the design and color alone may take a while and is fully dependant on your personal preferences. If you’re an eco-warrior or just very careful about your babies safety, an environment- (and baby-) friendly organic crib sheet, like the ones made by Magnolia Organics, is the perfect find for your little one. Magnolia Organics is a great example of a manufacturer creating products made from absolute 100% organic cotton without the use of fire-retardant chemicals. Green parents will be delighted to discover that every single step in Magnolia’s production process is as eco-friendly as it gets. Even the dyes they use are kind to the planet! It should come as no surprise then that the company is very proud of its official Global Organic certification. Magnolia’s high-quality crib sheets are cozy warm, and they are made to last. They won’t shrink in the dryer, either (Not that any eco-concerned parent would ever use a dryer, anyway). The sheets come in nine different colors, and when you consider that they are fully organic, they are really great value for money. Though they do cost a bit more than more basic cotton or cotton flannel sheets, the difference isn’t too large. Trend Lab’s flannel crib sheets are perfect for keeping your infant snug and warm at night. Made from 100% cotton, this extremely durable product stands up well to machine washing. Flannel crib sheets are great for the winter or if you live in a cold region. Trend Lab’s flannel will do an excellent job of keeping your baby warm. They fit just about any crib mattress really well thanks to the robust elastic that holds the sheet snugly without bunching up. You can choose from sixteen colors and patterns, some of which you’re bound to think are super cute! Polyester used to mean poor quality. Not anymore! The high-quality, durable, and very popular crib sheets from American Baby Chinelle are living proof that something really good can be made from synthetic fiber. American Baby crib sheets are very soft, and great in cold weather as they hold warmth really well. The fabric is tough and can easily stand up to repeated washing without taking damage. Available in 17 patterns and colors, as well as waterproof options you’re sure to find the perfect fit for your nursery decor. What types of crib sheets are there? Crib sheets are usually split into three categories, depending mainly on their material – flannel, polyester, and cotton. Each category has its pros and cons. Let’s look a little closer. If it’s quality you’re looking for in a standard crib sheet, then cotton is a good choice. Pure cotton is breathable and soft. It will keep your infant warm when it’s cold, and cool when it’s hot. Cotton is also a very safe option. Cotton sheets are hypoallergenic, so they are great for babies with allergies or skin irritation. It’s the softest type of sheet, highly durable, and easy to wash. The downside of cotton crib sheets is that they will wrinkle and will have to be ironed regularly. They can also feel a little rough at first and need time and a few washes to soften up. That said, cotton crib sheets are still the safest option. Polyester is used in all kinds of clothing and bedding. The natural synthetic is cheaper than other natural materials, including cotton. Some of you may shudder at the idea of putting polyester sheets in your baby’s crib, but thanks to huge advancements in the textile industry, polyester has become a viable and safe alternative. The major advantage of polyester sheets is that they’re more budget-friendly than other fabrics. They tend to be tear and wrinkle resistant and shrink less than cotton. The disadvantages? Polyester is less breathable than cotton, and it doesn’t exchange heat as well as cotton, so it’s probably not the best option for warm summer months. Polyester is not as soft as cotton, either. Flannel is snuggly soft and very efficient at trapping warmth, which makes it the ideal for crib sheets, especially on cold nights. It’s lightweight, very durable and gets softer with each wash. How flannel is manufactured varies as different sheets will contain different materials. Some are a mix of wool and synthetics, others might contain cotton and wool, some are fully cotton with only the texture being slightly softer. Flannel may be a mix of a whole bunch of materials, so it’s wise to always check the label before you buy, especially if your baby is allergic. The main disadvantages of flannel are that it can be unsuitable in warmer temperatures, and it can shrink in the wash. Plus, flannel of poor quality tends to pile, which may also happen to decent quality flannel products. Crib sheets are more than just a cover for your baby’s mattress. With such a wide range of colors and printed patterns available to choose from, crib sheets are an effective way to bring life and warmth into your nursery. Plus, a crib with a well-fitted sheet will always be the safest sleep environment for your little one.